Jan. 25 (NBD) -- The air transport industry is expected to gain 35.5 billion U.S. dollars in profits in 2019, slightly higher than estimation of a 32.3-billion-U.S. dollars profit for 2018, Alexandre de Juniac, director general and CEO of the International Air Transport Association (IATA), said to NBD Thursday. This year will be the ninth year in a row that airlines are in the black and more importantly the fifth consecutive year where airlines deliver a return exceeding the industry's cost. The IATA predicted that the air transport industry in 2019 will reap 885 billion U.S. dollars in revenue, up 7.7 percent from the previous year, and will handle 4.59 billion passenger journeys and 65.9 million tonnes of air cargo, both higher than their corresponding metric of 4.34 billion and 63.7 million in 2018. With regard to the jet fuel which is projected to eat into 24.2 percent of the average operating costs of airlines, the trade association estimated the aircraft fuel on average to touch 81.3 U.S. dollars per barrel, lower than 2018's 87.6 U.S. dollars per barrel. 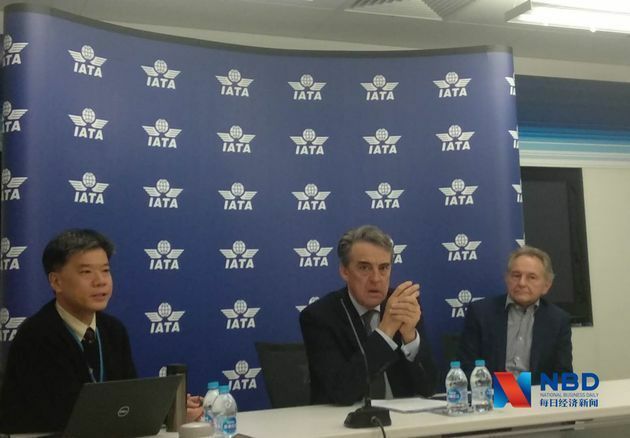 Juniac stated the IATA once expected rising costs to possibly compromise airlines' profitability, but falling oil prices and solid GDP growth projections have eased the pressure. Therefore, the association was cautiously optimistic that the situation of stable value creation for investors of the industry would last at least one year. But Juniac also warned against the possible downside risks, as the economic and political environments have some uncertainties. Turning the lens on China's aviation market, Juniac appraised safety and improved on-time rate of Chinese airlines and the country's aviation infrastructure. Beijing Daxing International Airport (Daxing Airport), a new multibillion-dollar aviation hub in China which is set to open on September 30, 2019, is a case in point. Juniac suggested that Daxing Airport should further optimize flights schedule and air traffic control surrounding Beijing should be enhanced to facilitate airlines. It's noticed that in the areas of Beijing and Tianjin, there already exist Beijing Capital International Airport, Tianjin Binhai International Airport and Beijing Nanyuan Airport. To better manage resources, these airports should cooperate with airspace management authorities and release related information in advance, Juniac advised. Beijing Nanyuan Airport, the oldest airport in China, will end services at the time when China Eastern Airlines and China United Airlines move to the newly built Daxing Airport. A source at Beijing Nanyuan Airport told NBD that the airport for the time being hasn't received any document requiring the shut-down and air tickets departing from there are still available.